Report on the internet today suggests that Microsoft is pushing the Windows Phone 7.5 Mango build 7740 update on a small portfolio of phone. Nokia is also said to preparing to push 7740 update to the new Lumia 800 soon. 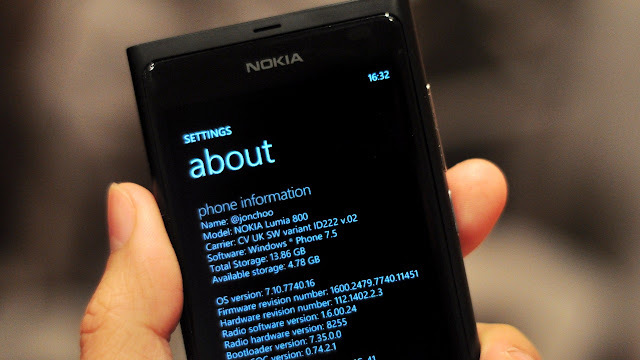 Yesterday Nokia reflashed my Lumia 800 from a prototype software to one that is running Windows Phone 7.5 build 7740. No official changelog was provided to me, but the 7740 is said to improve stability with Microsoft Exchange 2003 and voicemail notification. This isn't a Nokia-specific fix as these fixes will also be delivered to other Windows Phone handsets made by other manufacturers. The update has also fixed the power management issue that plagued all the review units running on prototype software. I have also noticed that the Lumia 800 feels snappier than before it was flashed, but perhaps that was because it was running on a prototype firmware. The speed difference between retail ROM and the 7740 update is likely to be negligible. Internet Sharing has not been included yet, as is an update to fix the camera performance and image quality. Nokia has confirmed that such fixes will come at later date. Nokia has also included several third party apps within the 7740 update. These includes eBay, British Airways, Sky News, Ministry of Sound and TripAdvisor. Fortunately, all of these apps can be uninstalled.